Above is today’s trip map created using my Trimble Outdoors Navigator iPhone app. We left Schenectady and after getting my Dunkin Donuts fix (153 feet from the hotel! 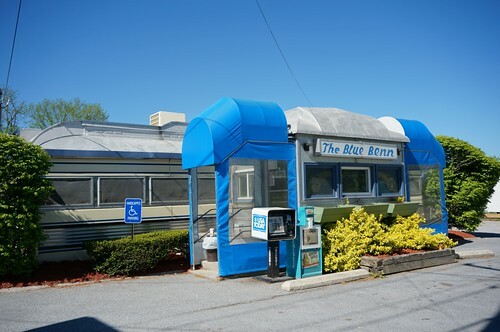 ), we were off on a side trip to Bennington, Vermont for a side trip to the Blue Benn Diner, highly recommended by one of my coworkers. We briefly took the Interstate until we reached State Road 7, which we took northeast, then SR 279 into Bennington. After discovering the Blue Benn is cash only, we quickly found a nearby ATM, and headed back with our wallet full and our stomachs empty! 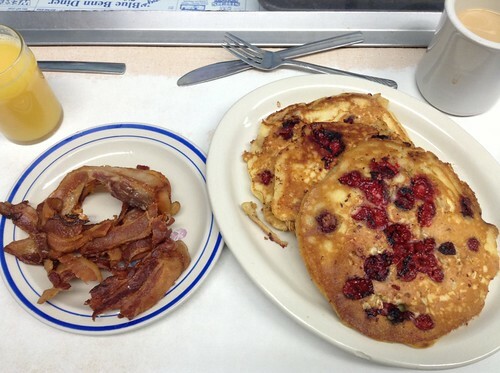 I’d been hearing about how wonderful the crunchberry pancakes were, so I already knew that was what I would order. I added a little bacon so I could have some protein to offset the carbs! The pancakes were as good as they look, if not better! 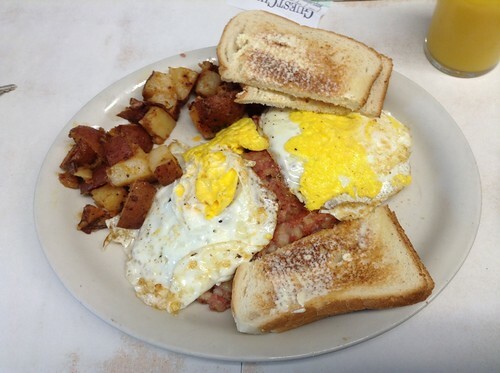 Pat opted for a slightly more protein-heavy meal of eggs, corned beef hash, and home fries with toast. After filling our stomachs and emptying our wallet, we headed out of Bennington on SR 9, and took it until SR7. On the way in to Bennington, we had seen a cool country store and would pass it on the way back, so we decided to stop. 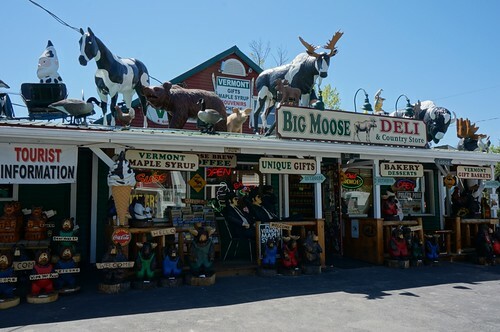 It was called the Big Moose Deli & Country Store in Hoosick, New York. We stopped to pick up some snacks and small souvenirs. We headed north on a local road into Hoosick Falls, and onto a few state roads until we picked up US 4. 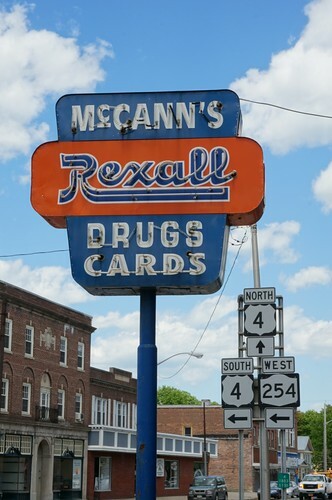 In Hudson Falls, we saw this neat old Rexall sign at the local pharmacy. Pat was in need of some ibuprofen, so we decided to stop and provide them some business. I also happened to find they had some homeopathic ear drops which provided some very much needed relief from the discomfort of my scratchy eardrums. We continued west on SR 254 until we intersected with US 9, and took that north into tonight’s destination, Lake George, New York. 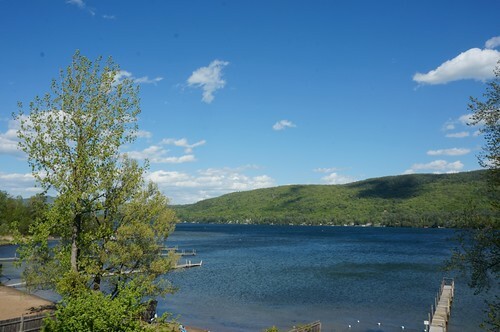 Lake George is a very popular tourist destination in the Adirondacks with loads to do for all ages. 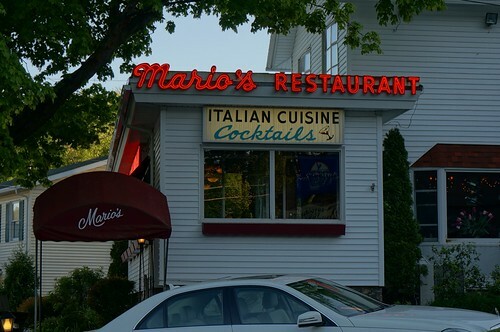 I’d been there as a child (don’t really remember) and again as a teenager with my parents and friend Joann. 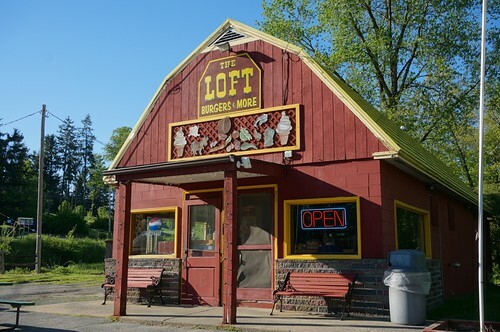 That trip was loads of fun, as we went to the now-defunct amusement parks Gaslight Village and Frontier Town and hung out in the bustling Village of Lake George. I was curious where we stayed on that trip, and had some vague recollections of where our motel was. I know it was in the actual Village, on the main drag, and recalled it being on a slight hill. Sure enough, I found two locations side by side, one of which was likely our motel. One was currently a motel, and the other was a nightclub with an area on the side that looks like it was at one time a motel. A little searching on the internet revealed that it was in fact, a former motel. This is the geeky stuff Pat and I really enjoy. 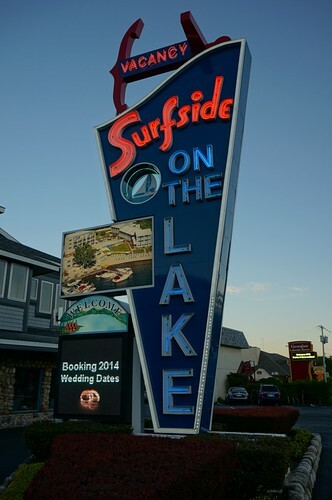 This trip, we stayed on the north side of the village, at the Sundowner Motel, right on Lake George. We were a week away from the start of peak season, so as we walked around town, though some businesses were open, more were not. We still got a feel for the place, and from what I described to Pat, he thought it would make a good place to add to our list of vacation destinations. It was actually about the same distance as his favorite childhood vacation destination of Park Rapids, Minnesota. This motel was directly next to ours. Nice sign! Despite coming down with some bad traditional allergy symptoms to something in the area (that I never usually have! ), we went for a late evening walk, with only locals around, at the few bars open on a Thursday night. This would look quite different in about a week, when the area would be teeming with tourists. We settled back in at the motel and had a peaceful sleep by the lake. Below is a slideshow of all of today’s photos. Click any photo to stop the slideshow and view the photos on my Flickr site.